PAHOA, Hawaii – White plumes of acid and extremely fine shards of glass billowed into the sky over Hawaii as molten rock from Kilauea volcano poured into the ocean, creating yet another hazard from an eruption that began more than two weeks ago: A toxic steam cloud. 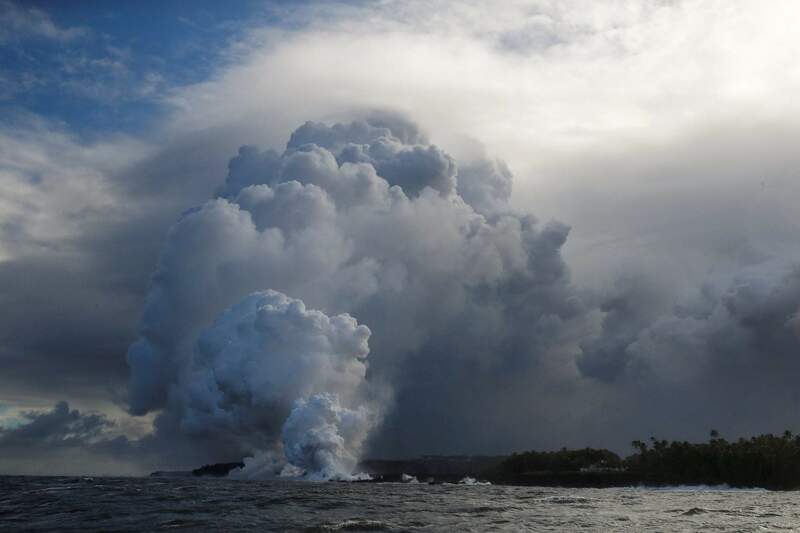 Authorities on Sunday warned the public to stay away from the cloud that formed by a chemical reaction when lava touched seawater. Joseph Kekedi, an orchid grower who lives and works about 3 miles (5 kilometers) from where lava dropped into the sea, said the flow luckily did not head toward him. At one point, it was about a mile upslope from his property in the coastal community of Kapoho. A plume of steam rises as lava enters the ocean near Pahoa, Hawaii, Sunday. 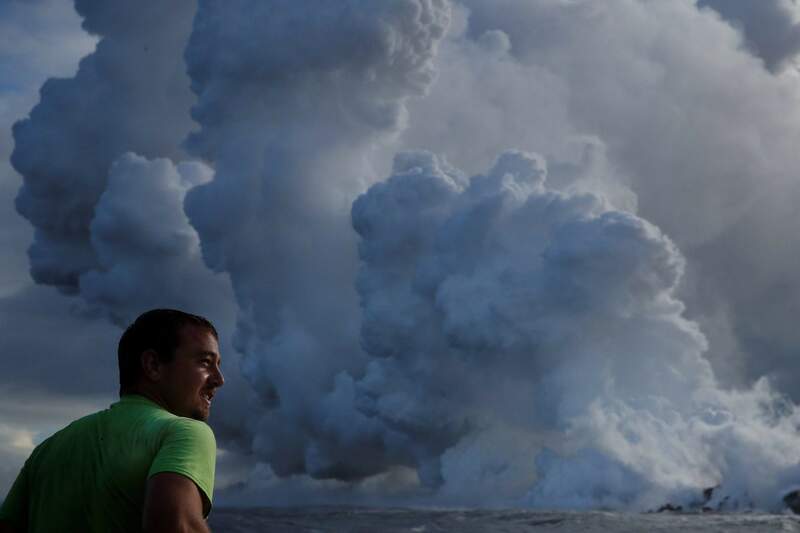 Kilauea volcano that is oozing, spewing and exploding on Hawaii’s Big Island has gotten more hazardous in recent days, with rivers of molten rock pouring into the ocean Sunday and flying lava causing the first major injury. The lava haze called “laze” from the plume spread as far as 15 miles west of where the lava met the ocean on the Big Island’s southern coast. It was just offshore and running parallel to the coast, said U.S. Geological Survey scientist Wendy Stovall. The molten rock that began emerging over the past few days was from magma that has recently moved down the volcano’s eastern flank from one or two craters that sit further upslope – the Puu Oo crater and the summit crater. Early Monday, a small eruption occurred at the Kilauea summit, producing an ash plume that reached about 7,000 feet. Officials said wind carried the ash plume to the southwest, toward the communities of Wood Valley, Pahala, Naalehu and Waiohinu.